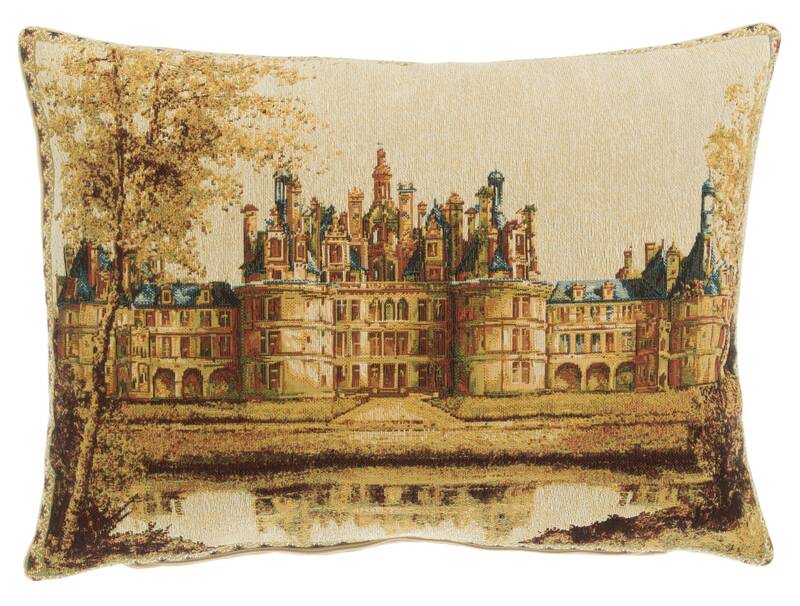 This Museum Collection gobelin cushion cover shows the royal Château de Chambord in France. It is one of the most recognizable chateaus in the world because of its distinctive French Renaissance architecture, blending traditional French medieval forms with classical Renaissance structures. This cushion cover is woven in Belgium on a jacquard loom with 100% cotton thread. It is lined with a beige velvet backing and closes with a zipper. The gobelin quality is obtained by a denser, thicker weft and as such is somewhat heavier than the regular tapestry quality. Size is 35x45 cms (14'x18'). We advise an inner of 40x50 cms (16'x20'), because we like our cushion covers well filled. Please note that this offer does not include the inner.